On paper, it's not much of a race. 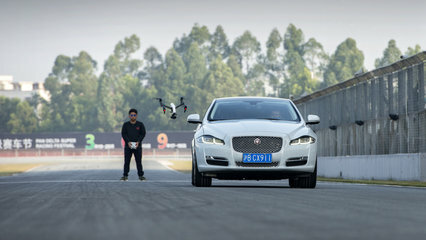 A DJI Inspire 1 drone with a top speed of 49 miles per hour versus a Jaguar XJ that gets up to 155mph, but when the two got together in China on Thursday, the result was pretty exciting. Jaguar paired Mark Higgins, a former rally driver who has driven stunt sequences in James Bond movies, against top drone pilot Lee Jae Hong to explore how drones could be used in movie chase sequences. At least, that was the stated reason. It all sounds like an excuse to have a lot of fun and in that, they succeeded. Video from the event shows the XJ racing between cargo containers, through a derelict car park and along tree-lined avenues, with the Inspire 1 in close pursuit. It all took place at the Zhuhai International Circuit, a race track in Zhuhai, a town on the Pearl River Delta just across from Macau.